This weekend we arrange some of the furniture we moved in two weeks ago to the Cottage -- just do make it a bit more livable - let's say civilized. 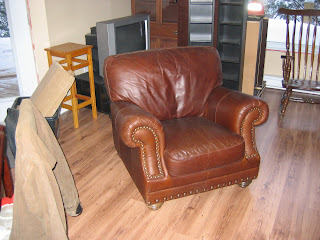 My greatest pleasure was screwing in the legs on my big old leather chair and sitting in it - in front of the wood stove. I savored the moment! It was a moment of I hope many to come. I keep promising lot's more to come and I have many posts planned, however, both work and continuing tasks at the weekend have kept me from posting. I promise much more will be coming - for those following I appreciate your patience!